here is some pics from the analysis i did and down is the ASCII data files for both instruments … i know it is not useful for you but your support and recommendations is highly appreciated. Hello Sherif, could you upload the csv files here directly? Those links you provided have loads of pop-ups and ads and all kinds of things. Perhaps I’m dumb but I cannot actually get the files! You should be able to upload the csv files here just like you upload the pictures. And interestingly that doesn’t look much better. I think the reason is that market is now working better with synchronized troughs, and not peaks. It is interesting to note that both analyses show the market rising into a 15-week peak. Dear David, thanks alot for your help. 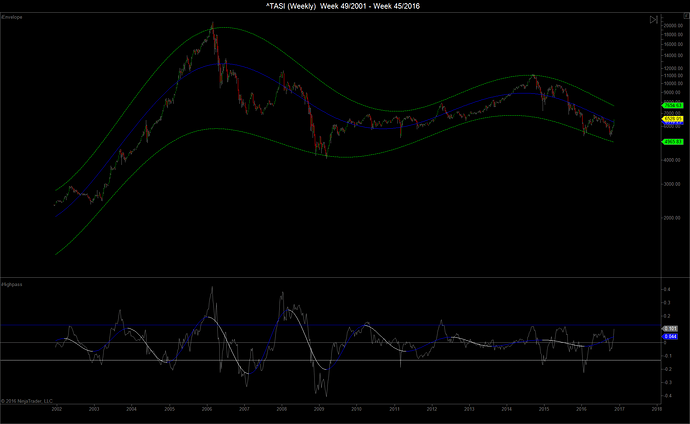 The shorter nominal model makes sense with TASI than the dafult one … appreciated. On a Long Term basis the saudi Index fluctuates within the Fractal of Price (0-20.000) . The Gann Octave is 20.000 / 8 = 2.500. 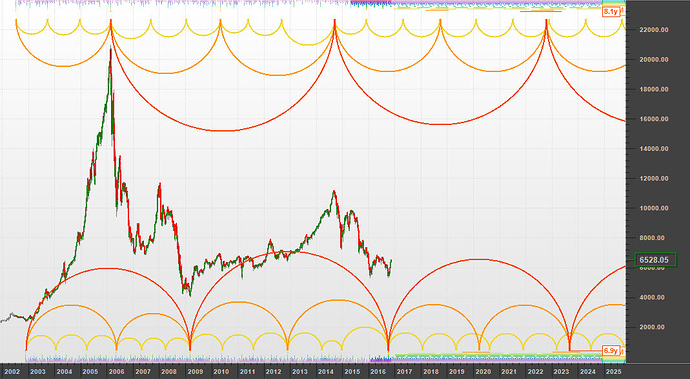 On a Middle Term basis since the Low of March 2009 the Tasi fluctuates within the Fractal of Price (1250- 11.250) = 10000 points . 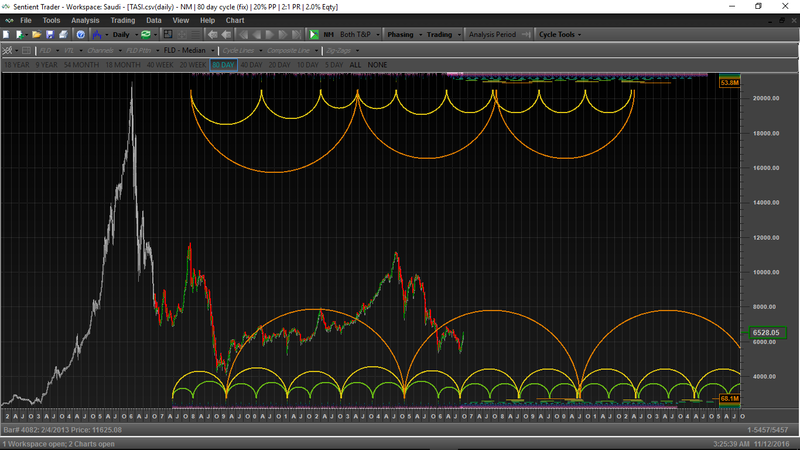 The gann Octave = 10.000 / 8 = 1250 points. 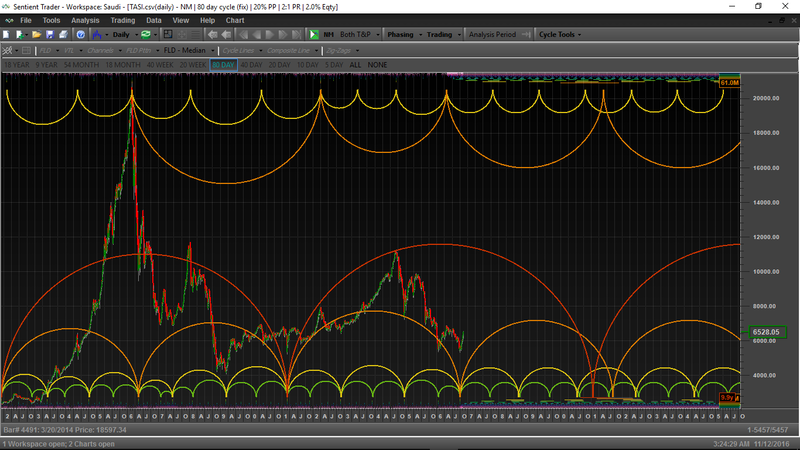 The chart below is a filter analysis of the TASI. The long term price waves are rather unique compared to other stock indices, emphasizing the need to evaluate each index or instrument individually. The shorter waves (not shown) sub-divide very nicely over the past several years which should facilitate with building an accurate custom nominal model in ST. I believe there is still some more data before 2001. Calculation is not correct without the complete data. 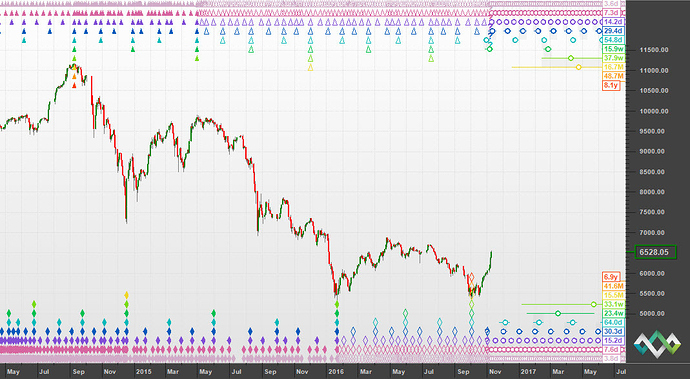 Roughly I estimate that 1996 - 2009 = 13 years, 2009 + 13 years = 2022. From the trendline, current is moving below the trendline therefore it has a high chance moving to form a new low and trap into long term triangle. thank you alain, wrandall and goh, you comments and guidance is very helpful. Please try to look for complete data in order to count more accurate. I roughly count it. 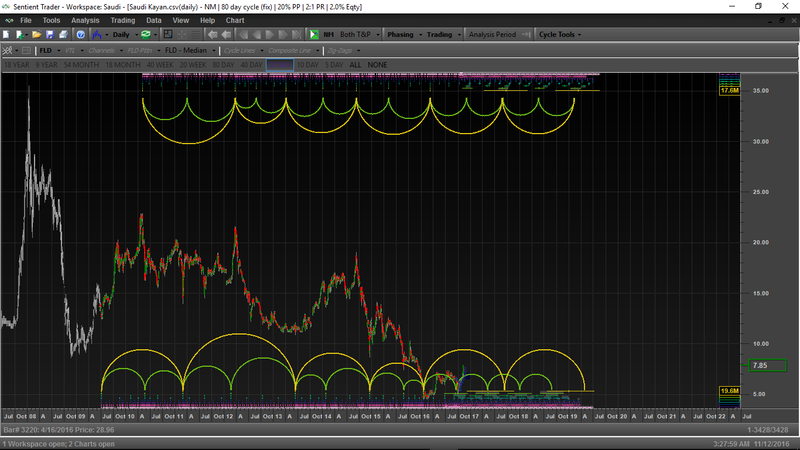 I see it has a correlation similar pattern to crude oil. Thus it shall not rise until walk out from triangle. 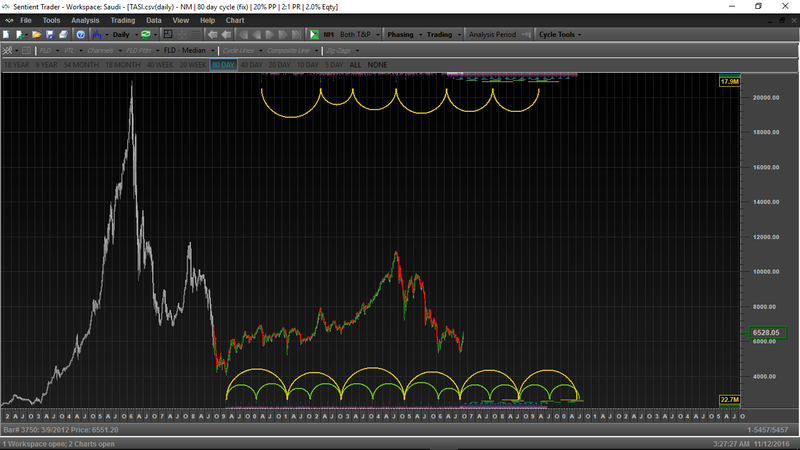 Yes, take fast profit in short cycle and run. This is crude oil. 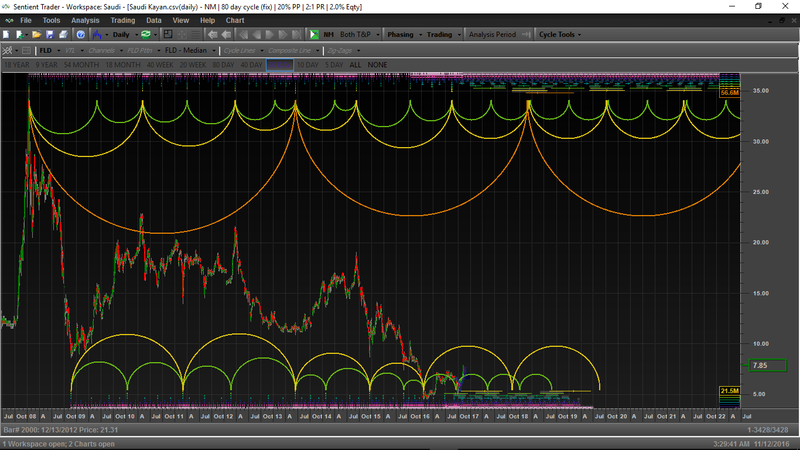 The column of boxes for top should be equal to bottom under quite certain period of time within these two trendlines. For crude oil, it started to show the bottom boundary now.